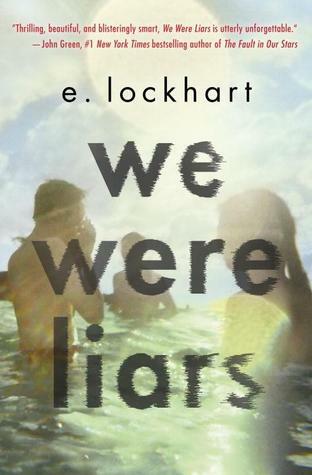 This review is specifically for the audiobook version of We Were Liars by E. Lockhart, performed by Ariadne Meyers. This book came recommended for me from Krystal, one of my current pen pals and past high school friends. I love, love, love receiving book recommendations from my letter buddies (Dad is Fat by Jim Gaffigan was also recommended to me this way) because it manages to add a bit more magic to the joy of receiving letters from friends. Most of my friends who read YA fiction have raved about this book and told me that it would keep me guessing until the very end when the narrator reveals all. Needless to say, I had some high expectations of this book to thoroughly entertain me through each chapter and to keep me guessing and mentally engaged until the very end. Unfortunately, I feel like the audiobook of this novel doesn’t do the story justice. The novel jumps through time very frequently, but that is much harder to follow in audiobook format because the cues that indicate that a time shift has happened are not as obvious when you hear the time change only repeated once versus reading the date on a page. Because of this, it took me a while to even notice that the timeline wasn’t continuous; this also eliminated some of the mystery that inherently surrounds the storyline, which I’m sure is much more captivating in print or ebook format. Since it was so easy to become disengaged from the book, I wasn’t trying to predict the ending of the novel while I was listening, and subsequently wasn’t shocked when the twist of the book was revealed. I didn’t predict the twist ending, but I also didn’t care enough to be surprised when I heard it. Some of the characters differ from the typical characters that are often portrayed in YA novels, which was pretty interesting. The central character seems to be more socially and culturally aware than other YA protagonists I’ve encountered, but at times, the text describing the main character seems a little forced and unnatural. That said, if you enjoy YA fiction, I recommend reading this in print or ebook format. As an aside, if you enjoy sending and receiving mail as much as I do, I recommend signing up for this extremely fun mail subscription box called Happy Mail. Publication Date: 13 May 2014 by Delacorte Press. Format: Digital Audiobook from Listening Library. This entry was posted in audiobook, mystery, Review, young adult and tagged ariadne meyers, audiobook, audiobook review, book, book review, Delacorte Press, e. lockhart, fiction, happy mail, listening library, mystery, reading, we were liars, young adult on May 3, 2015 by Bri with a book blog.